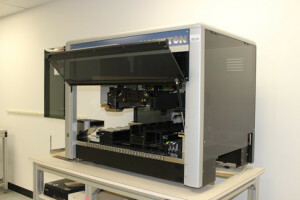 Used Hamilton Starlet liquid handling system. The instrument includes an 8 channel pipetting arm with independent Y axis, and CORE™ Technology for tip mounting, a 96 channel pipetting head, and an iSwap 5 axis gripper. The unit also includes deck hardware: pipette tip racks, temperature controlled plate racks, tube racks, microplate racks, and 50mL temperature controlled tube rack. All instruments are fully refurbished in excellent condition.